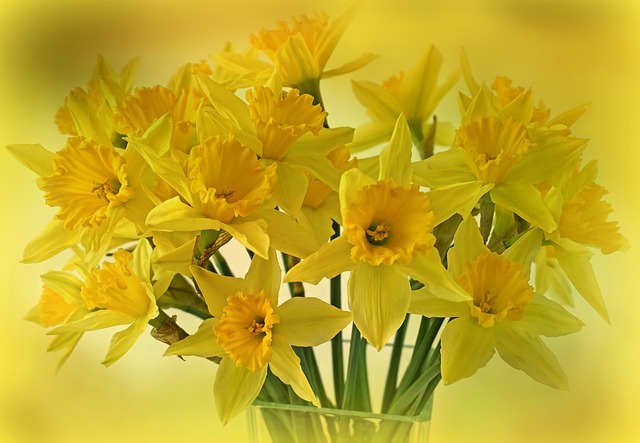 The daffodils are wilting in the glass vase and Grandad is tied in tubes. Snaked up worse than before. Wilting too. His body rusting like a car soaked in salty water. He’s been on the ward for a year, since the fall. Breaking an arm and hip. Confined to a bed or occasionally a wheelchair. IV bag dripping away last speckles of now lacklustre life. The flowers were our ‘thing’. No flowers this time. I’d started to get distracted by my own existence and stopped bringing bouquets to brighten his. I used to fetch them weekly. They gave us something to talk about that didn’t revolve around the probability of oncoming death. “To the ground I must go,” Grandad would say. “Maybe not so soon though,” I’d reply. He’d been a gardener all his life. Mother nature was his first love. And his last. He knew all there was to know about the world of flora. Names, colours, where they grew, how they grew, how to tend to them. But it was always the meaning that he adored the most; what they symbolized. The first bunch I took, wrapped in a bow, were Peonies. Delicate, blush pink petals, thick chopped stems. “Hints of power, romance and fortune,” he’d say. Tulips followed. Lush reds and sun yellows, a few dotted white. Thinner stems than the peony. Less support. “Love, in all its forms,” he’d say, brushing his fingers across them. “Because I love you,” I’d say, sickly sweet, as though I knew that’s what they meant. Roses, posies, hyacinths and a potted plant came after that. Lilies, too. Four months passed. Then came the daffodils. The final flower. The ones now drooping down under their own weight. Soggy tissue. When I gave him them – only a handful, he wrote down joy and happiness, on the back of a Tesco receipt. Throat too sore. I felt light headed and guilty. Today, I have none to offer. And nothing to say. There’s a Doctor in the room, scribbling down numbers, responding to the ‘bleep’ machine. Mum’s here. Asking questions. Then it’s time to leave. I look into his milky eyes and wish I’d spoken through our language. Through earth, stems, petals and spectrums of natural light. He can’t speak anymore. Sliding to relapse. Suffering a stroke in his starched bed only last week. Instead, he opens his bedside draw and hands me a tiny bouquet. Silk. With miniature baby blue heads and a polka dot yellow for the middle. Plastic leaves. Attached a note, ‘you can keep these for eternity,’ to the stem. I don’t ask him what they symbolise, for fear I would turn to tears. In the car home I Google them instead. How they look. That they seem to be wild. The search turns over four million results in less than a second, but it takes me a lifetime to recover. Grandad’s final flower. Forget me nots. About the author: A young writer from North Yorkshire, Emily has recently discovered that she actually likes creative writing, despite everything she may have previously said. She can also be found on Twitter @emily__harrison, and apologises in advance for her tweets. If you’ve enjoyed her story, please let her know in the comments below! Cynic that I am, my heart sank when I read the initial summary of this story. I am moved to tears by the honesty, the tragedy and the fundamental beauty of this story, delicately and unsentimentally told. I was surprised by the tears that welled in my eyes at the end of this sad, beautiful story of loss.